BONN, Germany (Landscape News) – A proposal by El Salvador to pool global resources and dedicate 10 years to promoting the restoration of more than 2 billion hectares of degraded land worldwide – a footprint larger than South America – will be central to discussions at an upcoming Global Landscapes Forum (GLF) summit in Nairobi. The initiative backed by other Latin American countries to launch a U.N. Decade on Landscape Connectivity and Ecosystem Restoration, would put landscape restoration at the forefront of national agendas by shoring up country level efforts to meet U.N. Sustainable Development Goal (SDG) 15, Life on Land. The U.N. decade would stretch over the period from 2020 to 2030, potentially leading to an increase in much needed funds to implement projects that could restore ecosystems, reverse land degradation and biodiversity loss. 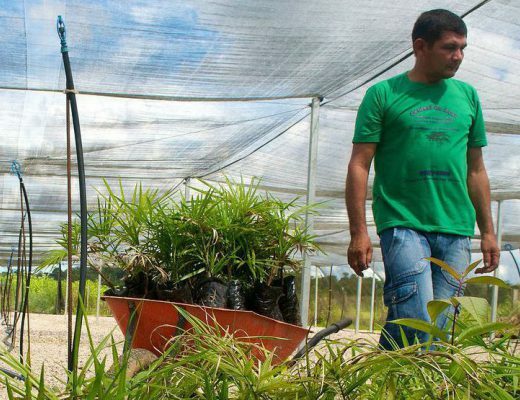 At a major International Bonn Challenge event in Foz do Iguacu, Brazil, El Salvador’s Ministry of Environment and Natural Resources also urged the international community to support a decade of landscape restoration. Central America’s smallest country already plays a leading role in Initiative 20×20, a framework supporting the Bonn Challenge through efforts to restore 20 million hectares of land in Latin America and the Caribbean by 2020. “We believe that all countries, in some way, both in the 20×20 Initiative and in the Bonn Challenge and in other areas are prepared to make a giant leap in restoration,” said Lina Pohl, El Salvador’s minister of the environment and natural resources. El Salvador was inspired by the notion of a thematic U.N. decade focused on implementing its 1 million hectare Bonn Challenge pledge due to its own successes in the arena, according to a report from the International Union for Conservation of Nature (IUCN). The event hosted by Brazil, and jointly organized by Germany’s Federal Ministry of the Environment, Nature Conservation and Nuclear Safety (BMU) and IUCN, led to discussions on forest landscape restoration experiences, innovations and financing initiatives. “The objective of the proposed decade would be to promote ecosystem connectivity and landscape management by encouraging synergy among biodiversity conservation, native vegetation restoration, maintenance of ecological processes, to reduce the consequences of the biodiversity loss, climate change and to promote sustainable development,” according to a Brazilian government proposal document seen by Landscape News. The objectives of the proposal dovetail with the agenda of the upcoming Aug. 29-30 GLF summit in Nairobi where more than 800 delegates and thousands more online, including heads of state, landscape restoration experts, policymakers, global media, finance experts, environmentalists, indigenous and community leaders, will meet at UN Environment headquarters to tackle continent-wide challenges related to land degradation. A U.N. Decade of Ecosystem Restoration could lead to a major influx of international aid for Africa, where an estimated 2.8 million hectares of land is deforested each year and land degradation remains a significant challenge. Delegates at the Nairobi GLF event will discuss landscape restoration in the context of AFR100, African country-level commitments to restore 100 million hectares of degraded landscapes across the continent by 2030. AFR100 contributes to the Bonn Challenge, a commitment to bring 150 million hectares of the world’s deforested and degraded land into restoration by 2020 and 350 million hectares by 2030 made during U.N. Climate talks in 2014. The African Resilient Landscapes Initiative (ARLI), the African Union Agenda 2063, the SDGs and other targets are also aligned with AFR100. Significant achievements have already been met, with Kenya, Rwanda and many other countries across Africa pledging to undertake substantial restoration activities. Land degradation is estimated to cost the global economy from $2 to $4.5 trillion a year, while economic benefits of restoration efforts are an estimated at $84 billion a year. From Global Landscape News (CC BY-NC-SA 4.0).